We have recently been made aware, by our Water Meter Provider, that when a Water Meter freezes and/or a Freeze Plate breaks, the intricate parts within the Meter Base become damaged causing the meter to read inaccurately or become unreadable. Therefore, starting January 2014 if you find yourself in this situation, it is our policy that a Water Dept. Operator will come to your home to do a Meter Base Replacement at a cost of $120. This amount can be added to your quarterly water bill. Please do not bypass this process. Contact our office at 315-342-6894 to schedule an appointment. 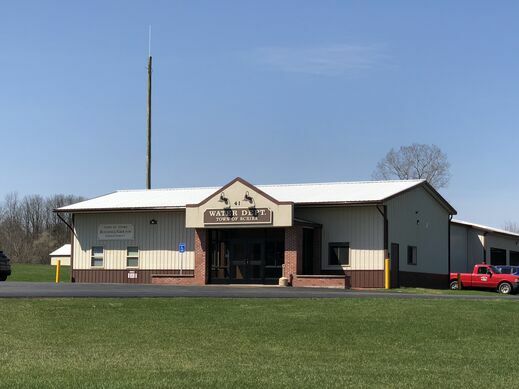 As you may know, we have been working very hard on finding a solution to the high sewer charges that Sewer Customers have endured in the Town of Scriba over the past several years. We have finally been approved to go to flat rate billing for the sewer part of the water bill starting with the January 2019 billing. The Flat rate will be $173. This is good news and will help most sewer customer’s to budget for their quarterly water bill. In order to be part of this flat rate billing, we need to replace your older meter with the newer style that we are now using. We have already started this process. We would like to ask that you please contact our office at 315-342-6342 at your earliest convenience to make an appointment for this meter upgrade. It is a quick appointment and we will do our best to accommodate your schedule. We will need someone present at the time of the appointment as we will need to gain access to the area where your meter is located in order to install the new meter. Appointments will be available Monday thru Friday 7:00 am – 4:00 pm and Saturday 8:00 am -12:00 pm. We are currently looking for part-time seasonal help for the Town of Scriba Buildings & Grounds Department. Applicants should have knowledge of building maintenance. Applicant will be performing some lawn mowing and weed eating for all town properties along with general maintenance and repair work on town buildings and equipment. Applicant must be 18 years of age and have a valid NYS Drivers License. Preference will be given to Scriba residents. Great summer job for a retired individual. Scriba Buildings & Grounds Dept. THE TOWN OF SCRIBA WATER DEPARTMENT WOULD LIKE TO TAKE THIS TIME TO THANK YOU FOR YOUR PATIENCE AND UNDERSTANDING DURING OUR TIME OF TRANSITION WITH BILLING SOFTWARE COMPANIES. AFTER TRIAL AND ERROR AND WITH CAREFUL CONSIDERATION WE WILL BE REVERTING BACK TO OUR ORIGINAL SOFTWARE COMPANY. THIS TRANSITION SHOULD BE SMOOTH, HOWEVER YOU MAY NOTICE SOME CHANGES. WE ARE HERE TO HELP YOU THROUGH THEM. PLEASE NOTE YOUR ACCOUNT NUMBER WILL NOW REVERT BACK TO YOUR ORIGINAL NUMBER. ALSO, WE WILL NO LONGER OFFER CREDIT CARD PAYMENTS OR E-BILLING. WE APOLOGIZE FOR ANY INCONVENIENCE THIS MAY HAVE CAUSED OUR CUSTOMERS. WE FEEL OUR DECISION TO REVERT BACK TO WHAT OUR CUSTOMERS ARE USED TO WILL BE THE BEST SOLUTION GOING FORWARD.